Squeeze the belly to turn this nightlight on and off. The GummyLamp Gummy Bear nightlight turns on and off by squeezing its tummy! These squishable plastic bears feature long-lasting LED bulbs and a one hour sleep timer. The ultra-portable GummyLamp requires 2 x AA batteries (not included) and can also be wall-mounted. 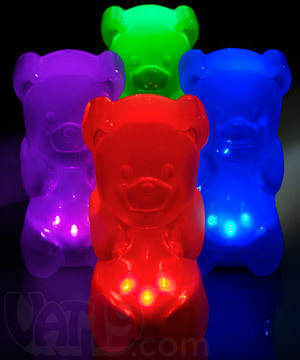 Dimensions: 7" x 3.5" x 3.5"
It's a gummy bear LED nightlight with sleep timer! It's no secret that we love gummy. 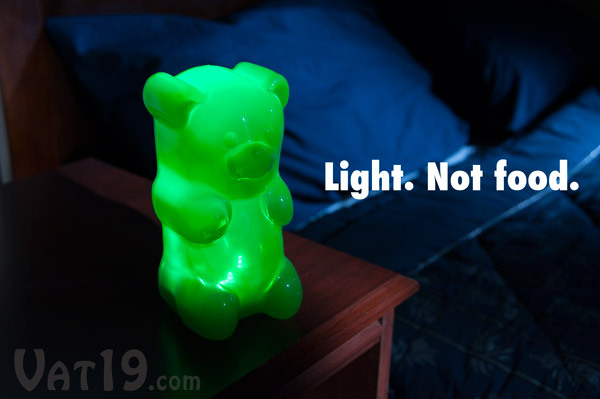 So, it should come as no surprise that when we saw the GummyLamp, we demanded that the manufacturer take our money post haste so that we could make them available to other gummy bear lovers. You can thank us later... by clicking that "Add to Cart" button at the bottom of the page! The GummyLamp is an awesome nightlight with sleep timer. Real gummy bears are squishy. The GummyLamp is also squishy. Unlike the candy, when you squeeze the GummyLamp, it lights up! The flexible plastic activates a switch inside the belly which makes a very satisfying clicking sound. If you like popping bubble wrap, you may not be able to put down the GummyLamp. No, you can't eat this lamp, but fear not! We offer a whole line of edible gummy products. 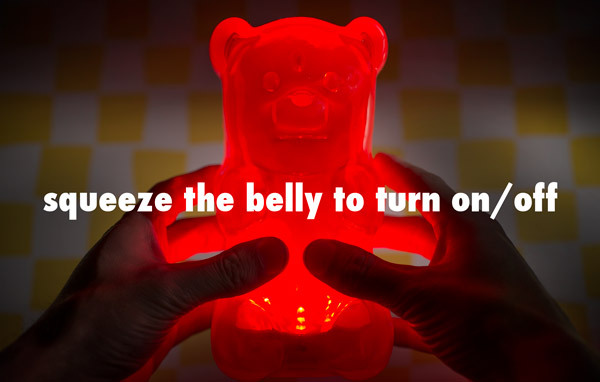 Just squeeze the GummyLamp's belly to activate the LED switch. 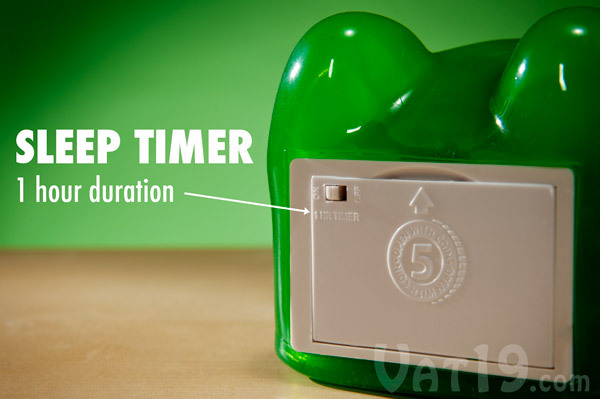 Activate the one hour sleep timer by flipping the on/off switch on the bottom of your GummyLamp. Use the one hour sleep timer to preserve power. 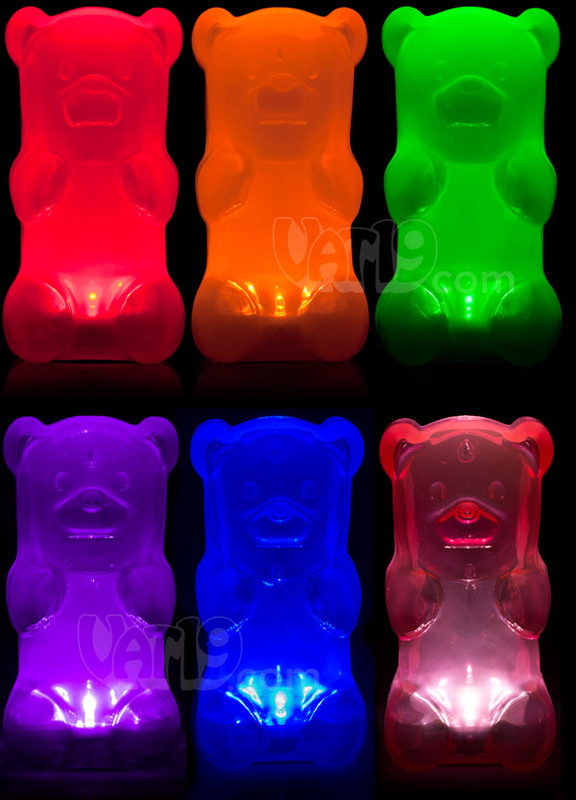 The GummyLamp Gummy Bear Lamp is currently available in red, orange, green, purple, blue, and pink. You should get all six. You wouldn't want to break up a happy family, would you? The GummyLamp is available in a variety of colors.